The Terra Scouts is an exciting new youth organization that is under development. It will in some ways encompass traditional scouting activities but in many other ways will be very unique. to strengthen the family unit while helping children to build self-esteem and confidence. Over the next few months, Members, that have an interest in scouting, may want to check back to this page from time to time, as more information will be posted, as it becomes available about this exciting program which is expected to begin in the fall of 2019. 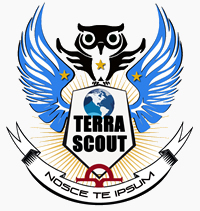 Shown above is a mock-up of the proposed emblem that has been designed for the Terra Scouts. We welcome any input you might care to provide about how it looks. Specifically if you like it or not and what about it in particular that you like or don't. To submit a comment please fill out the "Contact Us" form on this site. We appreciate all comments, good and bad, as it helps us to continue making improvements as we go along.